Ithaca Generator now has a functioning metal lathe. It can be used to make cylindrical, conical, and threaded features on metal and plastic parts. 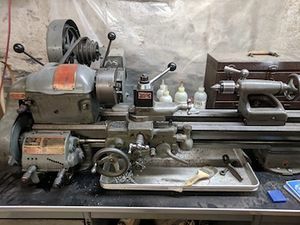 A few of you have expressed being interested but unsure what a metal lathe can do. Here's a video with some example lathe projects. I've been surprised by how enjoyable I've found it to be to operate a lathe, and I'm sure that many of you would enjoy it too. Use of this tool falls under all existing IG policies the same as any other backroom tool. Please be careful. Anyone interested in using this machine who would like an orientation just email the ithaca_hackerspace Google group. Jason or someone else who is familiar with the lathe will be able to show you the basics. No prior experience is necessary. We're all supposed to be here. Moved to the Machining page. Everyone anywhere near the lathe while it's being used should wear safety glasses. Nobody should approach or otherwise surprise or distract someone who is operating a lathe. Only one person should operate the lathe at a time. Be explicit about who is operating it, and don't touch any part of it if that's not you. No long sleeves, ties, jewelry, or other clothing or accessories that could get caught in the machine. Long hair should be secured up so that it can't get caught in the machine, and not just in a pony tail. Always unplug the lathe before going near belts or gears, and when doing anything else that could be dangerous if the lathe turned on. Never take your hand off the chuck key while it's in the chuck. It's too easy to forget it and have it become a projectile. Be aware that the lathe has a lot of inertia and will not stop immediately. This page was last modified on 1 April 2019, at 20:12.